All you have to do is head over and join our official Facebook page and drop a comment on the "Nascar Hat" thread there (not here!). Your comment serves as an entry into a random drawing for the hat. 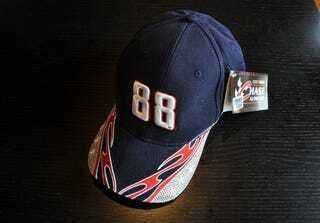 I bet you've always wanted to show your Nascar-followin', Dale Jr.-lovin' American pride right on your head. Now's your chance! All you have to do is join and comment.